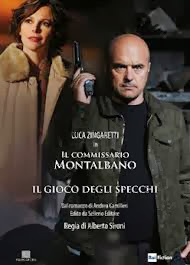 Hall of Mirrors is based on Andrea Camilleri's eighteenth Montalbano novel, Il gioco degli specchi, which has not yet been translated into English. The title comes from the film Lady from Shanghai. I also find the first programme suddenly corroborate more with the Young Montalbano than with the original series... a disappointment. Also the new Livia looks like Ingrid's sister... very disorientating.